For Kenneth, who has both Cerebral Palsy and enduring mental health issues, life was becoming increasingly difficult in his old home, a privately rented flat in a block where the lift was out of order more often than it was working and the glass wall and gaps in the floor of his balcony terrified him. With the breakdown of the lift becoming a frequent event his carers were forced to physically carry him up and down 4 flights of stairs, creating a significant health and safety issue. What’s more he had to pay a ‘top up’ fee of £150 per month in addition to his housing benefit (which was insufficient to cover his rent) to remain there. With his mental health unraveling and his ability to walk unaided diminishing due to his disability a significant, costly and – for Kenneth and his family in particular – devastating crisis was looming. Fortunately his Care Manager at London Borough of Hackney had the foresight to act and suggested that they contact MySafeHome to see if Kenneth may be eligible to part buy a home of his own using the HOLD (Home Ownership for people with a Long-term Disability) model. Having completed a simple one page eligibility form he did indeed seem to qualify and, encouraged by this news, his mum applied to the Court Of Protection (as Kenneth lacked the ability to act on his own behalf) so that she could help him secure a home that finally suited his needs. This process took four months to complete during which time they found the perfect 2 bedroom property (the extra bedroom’s for an overnight carer) on the site of the Olympic Village. It was closer to mum too, meaning she could visit him more often and contribute towards his ongoing care and support too. From gold medals to a golden opportunity for Kenneth and his family! 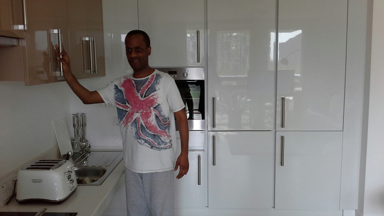 As Kenneth had no savings of his own mum paid the initial start up costs and deposit (this came to around £15,000) to secure a 25% stake in his new home and he now pays rent on the remaining share to his landlord, Triathlon Homes. £115 pm towards housing costs (£69 mortgage ‘top up’ + £46 per month for ongoing ‘life planning’ support, mortgage payment checking service and legal assistance in the event of any threats to benefit entitlement). This means that Kenneth is actually £35 per month better off now than he was in his old flat. Now that he’s in his new home the change in Kenneth’s health and well-being has been remarkable. “Kenneth is more settled now – not so nervous and he even uses his balcony!” observes his mum. But the benefits don’t end there, “We don’t have to worry every year about signing another tenancy agreement. This was really worrying us as we had to chase the landlord for up to 3 weeks, not knowing how much he was going to put the rent up by, if it was going to be affordable or even whether he’d renew the contract or not. This new flat is more spacious than the previous one too and we don’t have to worry about the “top up” housing cost payment increasing throughout his mortgage either”. A happier Kenneth, a stable home within which he can live for the rest of his life and a less stressed and worried family – HOLD has delivered all this and more, dramatically reducing the possibility of a costly and upsetting crisis situation occurring in the future as well as clearly demonstrating Hackney’s admirable commitment to one of the more vulnerable members of its community. To find out more about home ownership for people with disabilities please visit www.mysafehome.info, email ofni.emohefasymnull@seiriuqne or call 08000 121 333 for more information.